That’s how I get myself to do unpleasant things. Today I had to do medical stuff (nothing alarming, routine testing.) As my reward, I drove to Brighton to have lunch with my daughters. 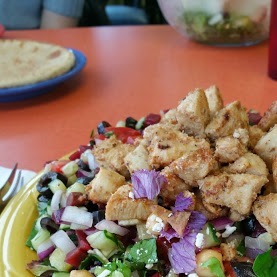 We went to Tomas Salad Shop, a little place on Grand River. They specialize in salads of all kinds, and stir fry. Some of you may know crazy I am for greek salad (minus the tomatoes and pepperoncini, please.) This place has the best chicken greek salad I’ve ever had! They only serve chopped salads! No work, easy to eat, perfect. As far as rewards go, usually I choose tovisit the book store, or some sort of shopping excursion. Never was so satisfied with a reward so healthy! But, of course, the company of my daughters was the best. “Fess up…do you bribe yourself into doing life’s unpleasant but necessary business. Or do you JUST DO IT? Kat, you and I are very much alike! Aunt Nan, I can just see you in your chair, enjoying! Lisa and Kel, you need to learn to get “twinkies” for yourself! Aunt Nan’s reward: a shot of whiskey! I guess I just do it most of the time. I have to bribe me to get my physicals and tests too. I get to go to a quilt shop, or buy a book as a reward. In extreme cases I get to shop at Home Goods, if I have a really hard time getting me to cooperate.